If you don't work on paper don't go anywhere. So many of these techniques can be translated onto fabric as well. I want to do one technique a day and I hope you will join me. This is how I made my "marked up" sketch book. Instructions for stitching the spine are in this tutorial. I would love to showcase some of your pages in a special post at the end of the month so please work along. 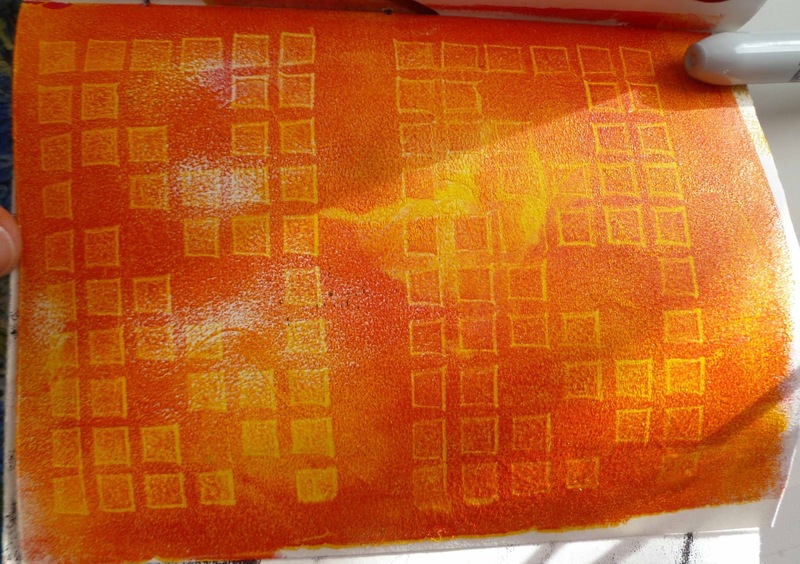 The first technique is Gelli printing. This can also be done on fabric using either acrylic or fabric paint. This was my gelli plate that I "ruined" trying to print with thickened dye. Don't try it. 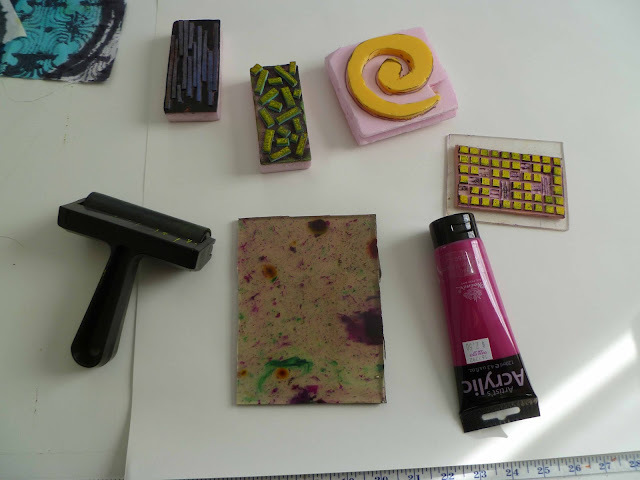 I remelted the gelli and it ended up looking like confetti. I used a knife to cut a rectangle the size of my page (4.5" X 6"). 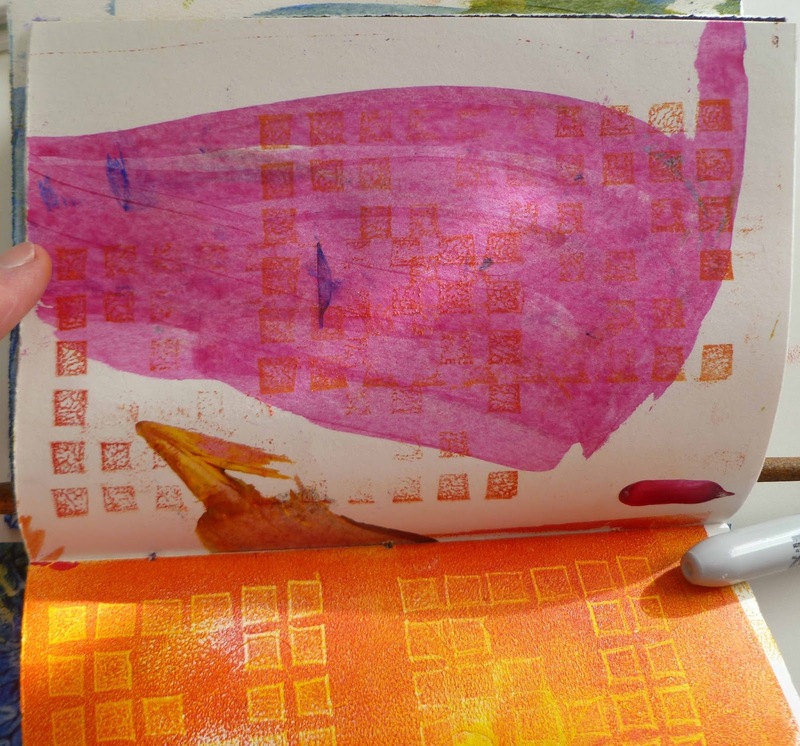 This page was printed solid yellow with a gelli then I put orange on the gelli plate and stamped it with this stamp which removed the orange on the stamped bits. Then I stamped the opposite page to bring the tiny square elements on the pink to bring the pages together using similar elements. 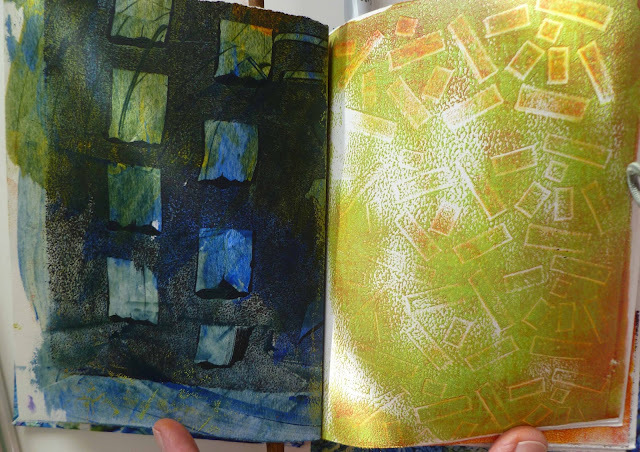 When I was done I had a bit of the green paint left on the brayer so I just rolled it onto a page as a first layer. Fun! The picture with stamps gave me some ideas for using up some large chunks of styrofoam I've been saving, plus some fun foam. Been wanting to create some stamps for awhile now, but keep getting sidetracked. Don't know if I'll get anything done to send pix, but do want to follow along - you always have such fun ideas! 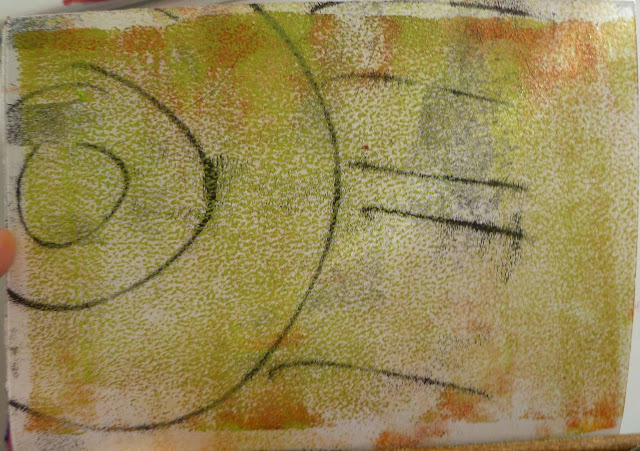 Dang, I left my Gelli plate at home! Good thing you posted directions on how to make one! I still have gelatin & glycerine from our purchase a while back. This will be fun! I have really enjoyed doing this project. This is so great, Beth! I just remembered your February gift to us all! Wonderful to have something to look forward to this month! Although I have finished all the posts for February I am still obsessively working in my book. I may make another one for the future. I've found just doing a page or two each day gets my creativity flowing.